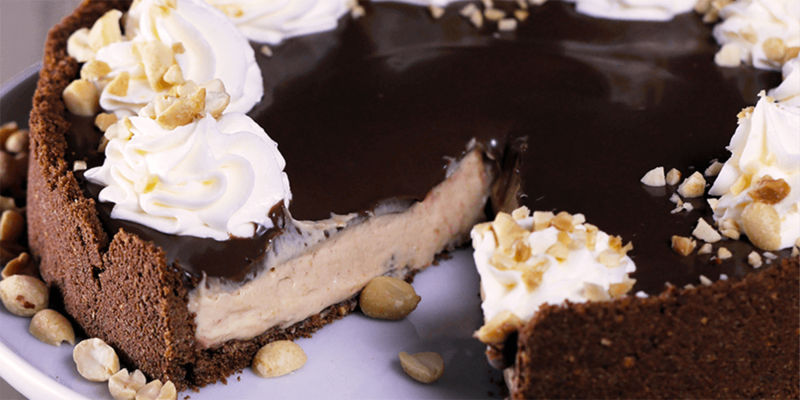 Peanut butter cheesecake-mousse, a chocolate graham cracker crust, whipped cream… and a topping of chocolate sauce and roasted peanuts… You cannot go wrong with this dessert. Place the cream cheese, vanilla, peanut butter, and Sola® sweetener in the bowl of a stand mixer fitted with the whisk attachment (or use an electric hand mixer and a large bowl). Whisk the ingredients for approximately 5 minutes until smooth, then gradually add the cream while whisking on medium speed. Spread the cream cheese-peanut butter filling over the chocolate crumbs and spread out using the back of a spoon or spatula so that you have a smooth, even layer, then place in the refrigerator for at least 2 hours to chill and firm up. To serve, transfer the pie to a serving plate and remove the sides of the pan. Decorate with whipped cream, a generous drizzle of chocolate syrup, and a sprinkle of chopped, roasted peanuts. For a tasty adults-only alternative, add 2 ounces (55 ml) of bourbon whiskey and ½-teaspoon ground cinnamon to the filling with the peanut butter.